Do you want to escape from VerticalResponse? Well, we’ve handpicked a few VerticalResponse alternatives that will help you to make a final and a better choice. Just scroll down to get into the information about the main features and pricing. Let me list down some cons of VerticalResponse which will help you in taking a better decision. Fewer customization features for designing templates. It is the major issue found in the reviews. The user interface of this site is a bit clunky, that means accessing this software is quite complicated and one needs a professional training to work on this software. Updates of this software come in very short intervals. so the main user needs to be very flexible to adapt and learn the changes. Now in this blog, you’ll find some services which might be new to you or maybe stranger to you. However, we really want you to trust us as in the world of innovation and invention, thousands of products are invented every day. Sometimes a product can be great but unknown to people. This happens because there are products which spend their major budget on improving the features rather than marketing. Our selected services are free from the flaws of VerticalResponse and they have got a lot more features. There are many VerticalResponse alternatives present online. It is the best VerticalResponse alternative which is used by many professional email marketers. It empowers you to send emails in bulk. 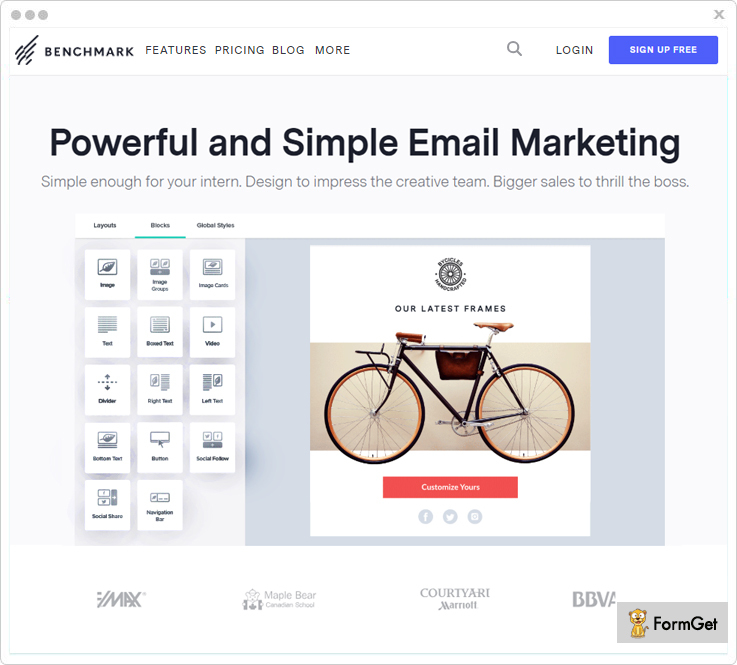 Further, it lets you create beautiful and attractive email templates using drag and drop builder which in turn helps you to get higher open rates & attract more people towards your business. Also, when you do a list segmentation with MailGet Bolt and send your emails to only the targeted leads then definitely open rates hike up! You can create your contact list either manually or by adding a CSV file. You can also send followup emails to the person who has abandoned your sent mail. It is a very convenient software that even beginner can use the website easily. 1. 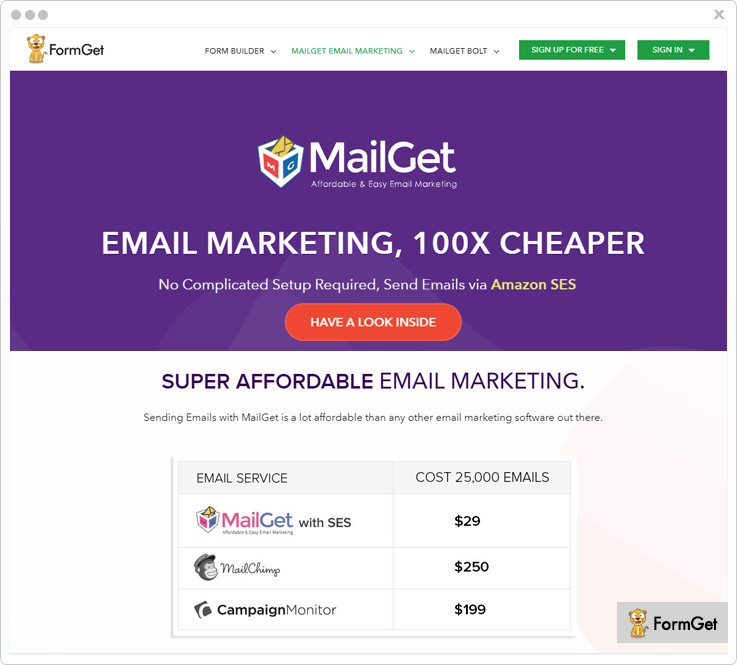 MailGet has got 500+ pre-built templates which can be customized as per your need to start your email marketing campaign in a go! 2. You can schedule a specific date and time to send emails to chosen contacts. 3. A dynamic feature of ‘Auto Responder’ is given to the users, which will automatically send a reply, according to the situation. 4. We can set up ‘Drips’ to mail our subscribers on short intervals. Price plans of MailGet are very affordable, They ‘Charge less and serve more to the customers’. They have Monthly and Yearly plans Both. Starters: You can send emails to 2500 subscribers for $9/Month. Rookie: You can send emails to 5000 subscribers for $19/Month. Pro: You can send emails to 10000 subscribers for $34/Month. Advance: You can send emails to 15000 subscribers for $49/Month. It is one of the finest professional email marketing solution, by which you can send emails to promote your business to different contacts in bulk. ‘It is the most reasonable email marketing solution than other email marketing software out there’. Moreover, this service has a huge variety of integrations, you can easily integrate Google Analytics, Zapier, and Wufoo to your MailGet account in a matter of minutes. 1. MailGet’s list cleaning feature will filter your contact list. By this feature, Incorrect email address and spams will be automatically cleaned. 2. SMTP routing in MailGet enables you to send emails using different vendors at one place. 3. The build in lead capture tool helps you to capture leads through a form. Further, this form can be embedded/shared on different sites to capture the leads. 4. In MailGet whenever a person opens your email, you will get all the information of person device, browser, operating system and country by ‘Email Tracking Feature’. As already Mentioned that It has the cheapest plans. The Monthly Subscriptions are divided into 4 Categories. Starter: $5/Month to email 5000 subscribers. Rookie: $29/Month to email 25,000 subscribers. Pro: $49/Month to email 50,000 subscribers. Advance: $79/Month to email 100000 subscribers. 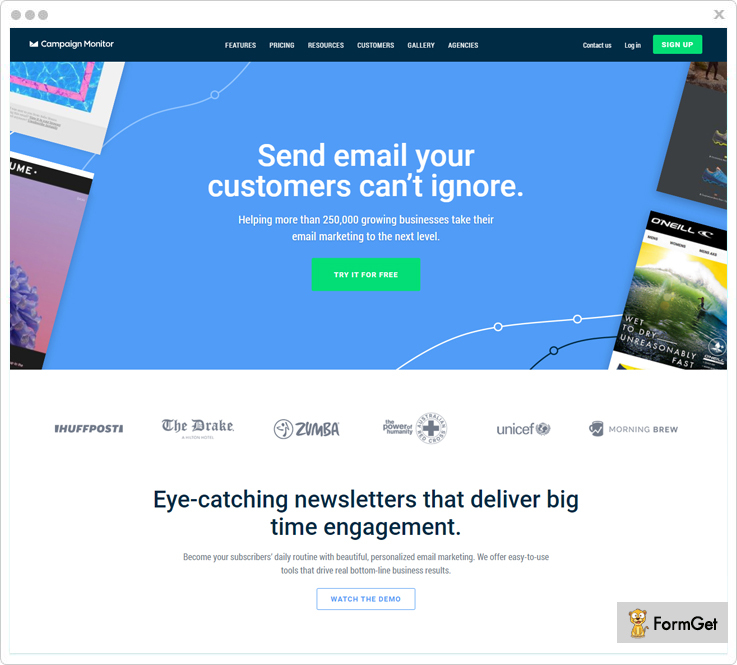 An easy email marketing service that provides you the best features. With that, it also offers a 30 days free trial to new users so, they can test and try before buying it. The trial version of this website is limited to 100 email addresses only. This website also offers a consulting staff for email marketing solution, which is a unique feature. iContact provide personalized, one-on-one expertise to the user. In short, they have got a responsive support team to rely on. 1. iContact offers you A/B Split testing for your email templates. So, this way you can closely analyze and compare the templates that you create and based on users behavior, you can make your final choice. 2. You can track the individual’s behavior on your sent email by our real time data provided by Performance tracking feature. Like you can get the real time click analysis on each of your sent email. 4. iContact also helps you to stay in front of the conversation with blog writing and press releases. Essential: $32/Month You can send unlimited emails with features like Segmentation, A/B Splitting and many more. Professional: $99/Month this has all the features of ‘Essential Category’ + workflow, triggered message, landing pages etc. Constant Contact provides us with a wide range of template formation which helps to give a great look and create a positive impression towards the email recipients. The best feature of Constant Contact is that it enables us a mobile optimization of email templates. By using this, our email template will be displayed the same in all the devices as it is displaying on the computer screen. 1. It offers you the features of ‘Polls and Survey’ to get excellent customer feedback. 2. You can also create invitations and tracks for Upcoming Events. 3. Also, you can generate a fundraiser request email and collect donations online. 4. Then it gives a feature to promote or pull your content directly from your email template. Email: $20/Month, send unlimited email with 1 GB file storage capacity. Email Plus: $45/Months with unlimited emails and 2 GB file storage capacity. Benchmark ensures us to send the “Right email to the Right person at the Right time”. It offers 250 free emails to subscribers. So that we can learn all the functionalities of software and upgrade only when we feel right. It’s not just for creating and sending but this software is so matured that you can monitor your real-time reports of sent emails. 1. It has an automated trigger system, in this when a customer subscribe it will automatically add him to the contact list. 2. Also, it sends a follow-up email to the subscribers who have abandoned the email. 3. Deliver the scheduled message based on if your email was opened or links were clicked. 4. It provides you data about your sent emails like which emails are bounced, opened, unopened or subscribed and more. It offers subscription in 4 categories. Medium: You can send unlimited emails to 1,000 subscribers for $21.99/month. Large: You can send 8,40,000 emails to 60,000 subscribers for $346.99/month. Extra Large: Here you can send 21,00,000 emails to 1,50,000 subscribers for $758.99/month. Massive: You can send 1,60,00,000 emails to 11,40,000 subscribers for $4,800.00/month. 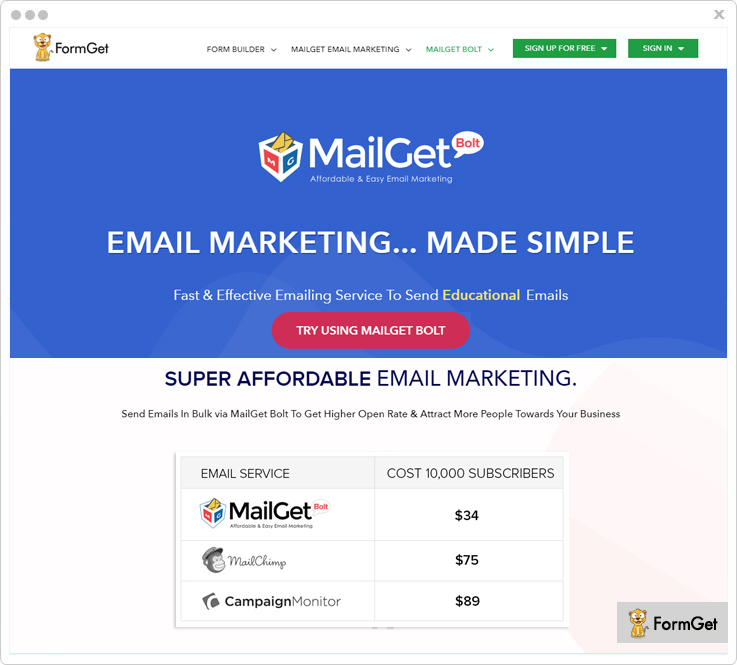 A best in class service for email marketing that provides all the tools you need to make meaningful connections and grow your business. It gives you a feature to send email templates, newsletters and messages targeted to each contact’s interests. They work with a motto that they ‘Make every campaign you send feel personal’. 1. It offers an autoresponder feature by which you can send a series of automated email to the subscriber. For example, you can send welcome emails or delivery emails or confirmation emails and so on. 2. It has a trigger email system, where the emails automatically sent based on the subscriber’s action. Like, whenever a subscriber purchase something from your site or visit your site or when your subscribers are most interested, the email will be sent to him accordingly. 3. Further, it has a multi-user editing system where you can create or edit your email campaigns with your team. 4. With ActiveCampaign’s mobile optimization feature, you can make your email look as same in mobile and tablets as they look on your desktop. Lite: $17/ month with unlimited sendings. Plus: $49/month with all features of lite and additional features. Professional: $129/month with unlimited sending and many professional features. Enterprise: $229/month Includes all the features from professional category plus additional features. It is one of the best user-friendly VerticalResponse alternatives. Mad Mimi works in a simple term to ‘Create, Connect and Send”. That is why this software is used by the people who wants a easy email marketing platform. It is used on small-scale business. 1. 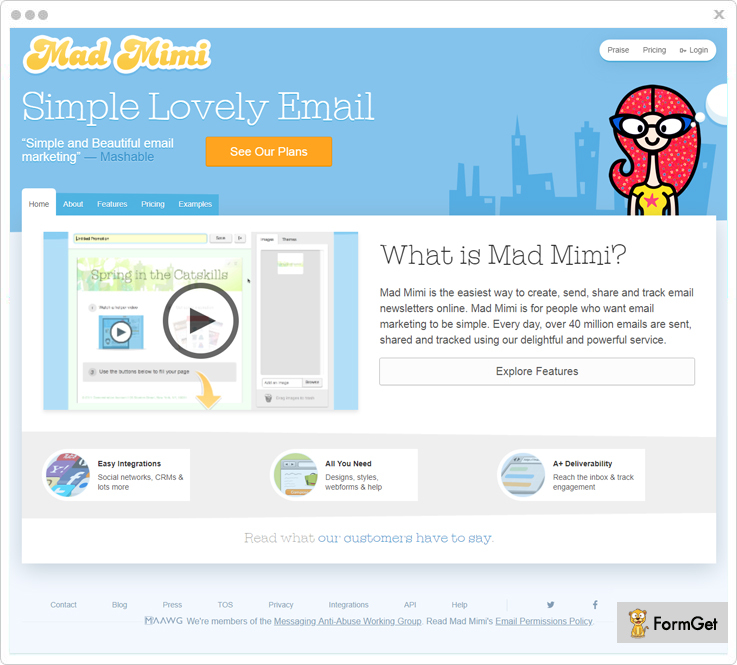 If you want to design a beautiful and mobile-friendly email then it is recommended that you should go for Mad Mimi. 2. It enables you to attach social icons in your email templates like Facebook, Instagram and so on. 3. With Mad Mimi multi user platform you can link your team with your Mad Mimi account. 4. Also, with it’s RSS feature you can promote your blog posts also. Just simply copy your blogs URL and paste it in your email template and send it to your contacts. It offers you subscription in 4 Categories. Basic: $10/Month With 500 Contacts. Pro: $42/month With 10000 Contacts. Silver: $199/month With 50000 Contacts. Gold: $1049/Month With 350,000 Contacts. This VerticalResponse alternative has some important and very helpful features which will help you to grow your business and connect with your customers live. With using GetResponse you can connect live with your customers and make them feel that they are part of the community. 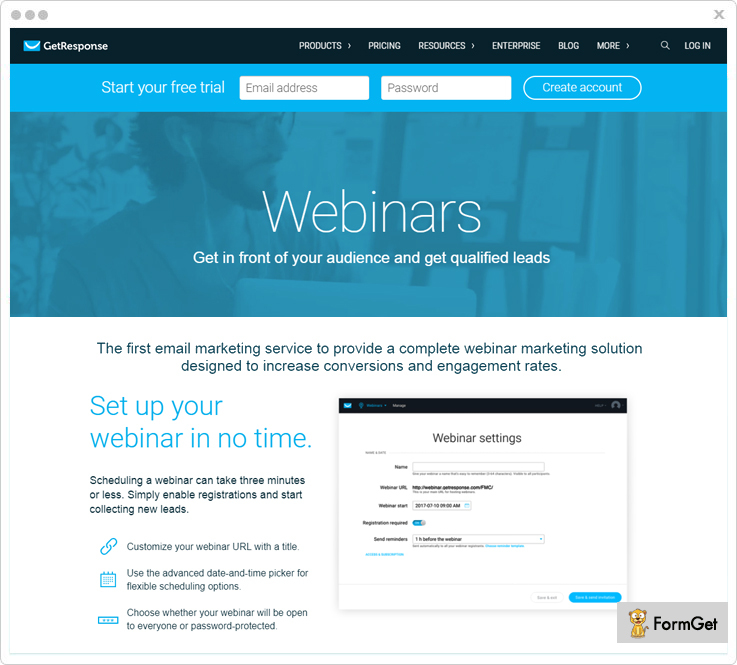 The best feature of this email marketing site is their ‘Webinar System’. Where you personally come in front of your subscribers and have a conversation with them. GetResponse can be considered as one of the best professional websites for email marketing. 1. The website provides landing pages, which will help you to capture more leads. 2. 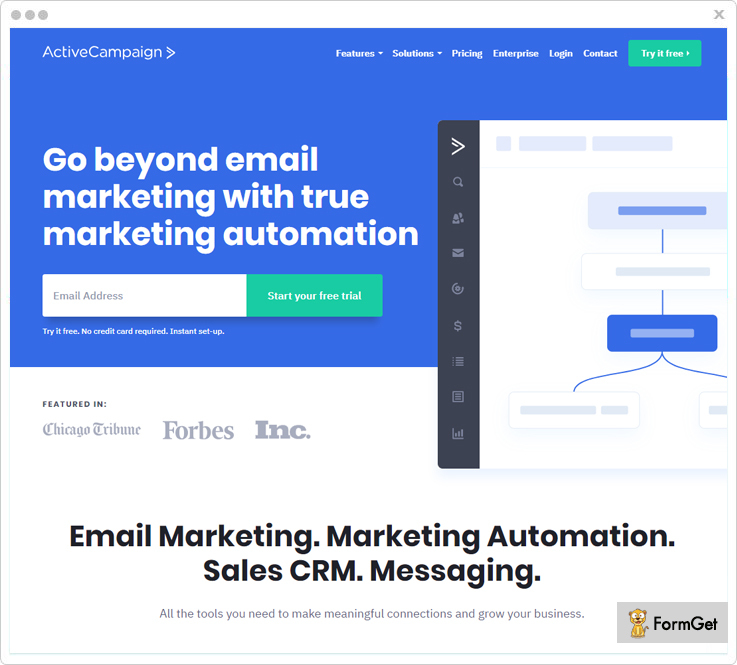 It provides a marketing automation tool which is a platform that marketers use to plan, coordinate, manage and measure all of their marketing campaigns, both online and offline. 3. With GetResponse, CRM you will have everything you need to turn your email leads into sales. 4. Further, it offers eCommerce tools which you can use on your email templates. By these tools, subscribers can buy your product, you can give the recommendation on buying, and offer similar products. Its subscription comes in 4 categories. Email: $15/Month with 1000 Contact List Capacity. Pro: $49/Month with 5000 Contact List Capacity. Max: $65/Month with 10,000 Contact list Capacity. Enterprise: $1199/Month with 100,000 contact list Capacity. This is the only software which provides you with an image gallery. The pictures from this gallery show different templates, which have different categorizations like top 100 email templates, featured newsletters and more by various customers. It provides you with a 24×7 customer support through the experts. Campaign Monitor believes that email marketing is not just a promotion platform, it is an email conversation between friends. This is their approach to make the recipients feel important. 1. It offers to make personalized customer journey which will help you to engage subscribers and may convert them into customers. 2. Further, it gives you detailed statics of your sent emails. For example, open rates, click rates, bounce rates and more. 3. It’s list segmentation feature is quite better as compared to others. Here, we can analyse our customer data and adjust our contact list into different segments and send relevant emails to them. 4. It also enables you to connect with hundreds of business apps like Shopify, WordPress, Magento and so on. It offers subscription in 3 categories. Unlimited: $29/month unlimited email sending capacity. Premier: $149/month unlimited email sending capacity with phone and email support. 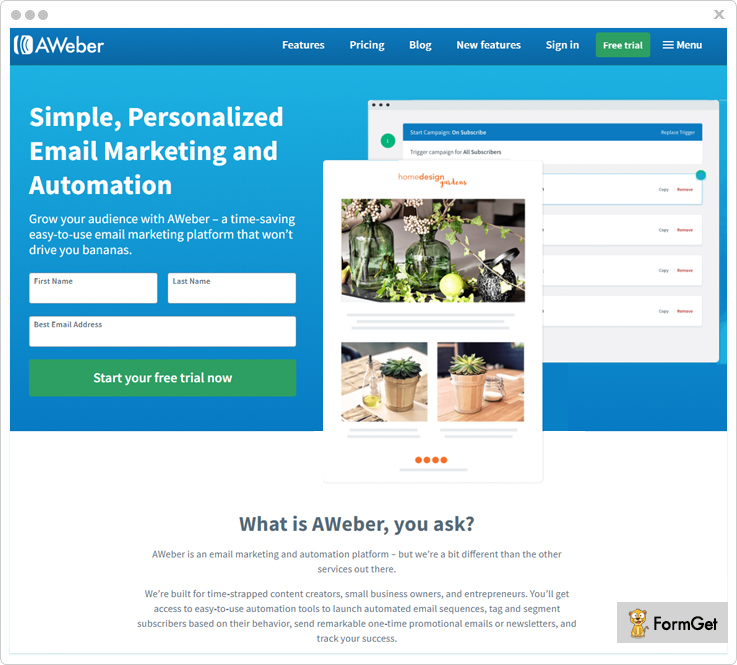 AWeber makes it easy to create separate newsletter lists and schedule emails and drip campaigns. They offer 24×7 customer support where issues of customers are handled by the experts. 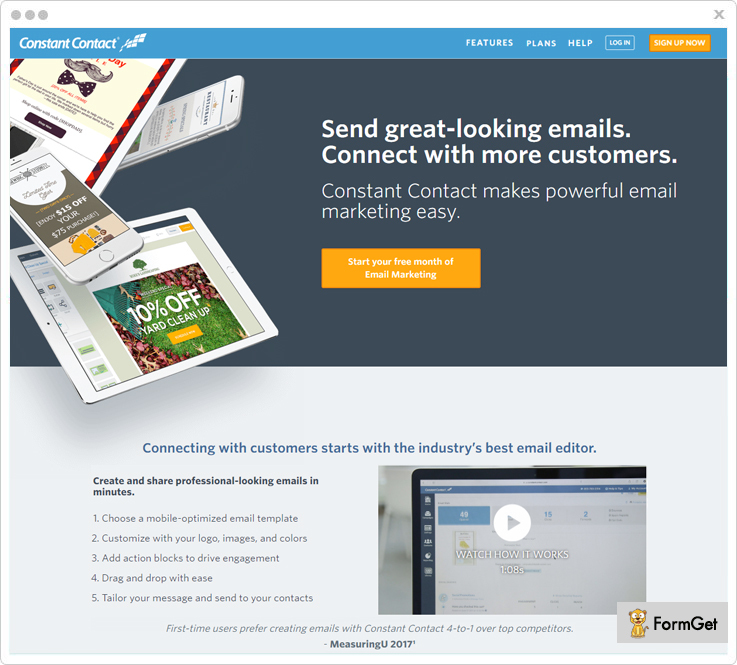 This is one the most simple and user-friendly email marketing software. It also offers you 30 days free trial by which you can go through all the features and buy the plans only when it feels right. 1. It enables you to integrate with many online tools to automate your list growth like PayPal, Dasheroo, Raven tools and many more. 2. This software also offers a suite for mobile apps also. 3. It’s Webinar feature is available for free, by which you can connect live with your subscribers. 4. The RSS feature of this software will automatically create an email for your blog post. It will help you to promote your blog through email. $19/month you can send unlimited emails to 500 subscribers. $29/month you can send unlimited emails to 2500 subscribers. $49/month you can send unlimited emails to 5000 subscribers. $69/month you can send unlimited emails to 10000 subscribers. $149/month you can send unlimited emails to 25000 subscribers. As we came to the end of our blog, I hope this information will help you to have an idea to choose the best website for email marketing. You can also use this blog to differentiate between the present services. Your feedback and response are valuable for us.